We have made a new model of our elf (fantasy) ears. What makes these different from the first model is that these are slightly shorter and stands out more from the head (Some would argue it’s the more cute kind of elf ears). It has the same features as the the sharp model with loads of customisations. I would like you to lend me your ears… Because I have some highly detailed Elven ears to present for all you elves and fairies (Or demonic if that is your cup of tea). 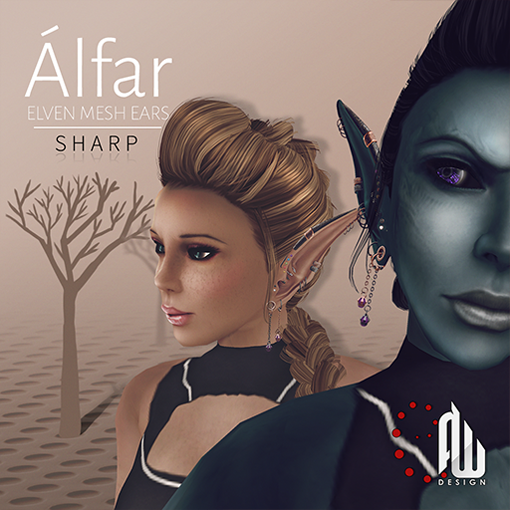 Elegant Elf ears with detailed textures. 46 pre-rendered skin textures (20 human, 26 fantasy). Ornate with a wide range of piercings with 12 metal textures, colour tinting, shine, glow etc. All changeable through a HUD.